Francois David, 5th son and 7th child of Jean Pierre David and Marie Magdelaine Monmellian, was born on 16 June 1727 at Louisbourg and baptized the same day. His godparents were Francois Darpix and Clere Marlin. Presiding at the baptism for the Father Superior was Fre Michel Ange le Durf. Witnesses attending the baptism was Jean Bernard and Francois Dardy. Very little is known of Francois' life at Louisbourg between 1727 and 1753 for only 2 primary source records have been uncovered to date which document his name. These include his baptism record in 1727 and another baptism record that lists Francois as a witness on 9 September 1753. His name is also listed within 2 Fortress of Louisbourg secondary source abstract documents, a Family Reconstitution File and a Historical Memoranda of his father, Jean Pierre David. In addition, the Louisbourg 1734 Census record indirectly indicates his presence in Louisbourg for that year. The baptism record above is of significance importance for it is the 1st of 3 recordings of the signature of Jean Pierre as an "X" over the "mark of the father, i.e., "marque du pere" at the end of the baptism record, further confirmng that Jean Pierre was illiterate. The other 2 signatures of Jean Pierre are noted in the baptism records of Francois' younger sisters, Marie Magdeliene in 1741 and Jeanne Angelique in 1743. Between Francois' birth in 1727 and the Louisbourg Census 1734, the births of 3 more children blessed the David dit Saint Michel household, Francoise Charlotte on 10 April 1729, Etienne Thomas on 21 December 1730 and Louis on 02 September 1732. Unfortunately, along with this joy came much sorrow. For during this period, Jean and Marie tragically buried 3 of their children with the deaths of their 1st son, Pierre, on 30 January 1730 at the age of 11 years, their 1st daughter, Magdeleine, on 09 February 1733 at the age of 12 years and Etienne Thomas on 01 April 1733 at the infant age of 2 years. The Louisbourg 1734 Census seems to account for all surviving family members at that time. It also lists Jean David dit Saint Michel of Nantes, a blacksmith, his wife, Marie Magdelaine Monmellian, 4 sons under 15, Jean Jacques, Jean Baptiste, Francois and Louis, and 2 daughters, Marie Josephe and Francoise Charlotte. In 1734, their 2nd son, Michel would have been at least 15 years of age or older and for that reason was possibly not included in this census. The last 5 of Francois' siblings to be born at Louisbourg were Claude Thomas born on 20 December 1735, Jacques Andre born on 30 November 1737, Jeanne Olive born on 10 July 1739, Marie Magdeleine born on 16 January 1741 and Jeanne Angelique born on 21 December 1743. According to the Fortress of Louisbourg Historical Memoranda Series 1964 to Present H F 25 1989 titled Jean Pierre David dit Saint Michel: Blacksmith authored by Eric Krause of Krause House Info-Research Solutions, Jean Pierre and Marie Magdelaine were still living at Louisbourg in 1744 along with their surviving children of " 5 boys for certain, possibly 6 and 5 girls." These children would probably have included their sons Jean Jacques, Jean Baptiste, Francois, Louis, Claude Thomas and Jacques Andre and their daughters Marie Josephe, Francoise Charlotte, Jeanne Olive, Marie Magdeleine and Jeanne Angelique. The "possibly 6" son referred to was probably Michel who married Genevieve Hebert on 20 January 1744 in Grand-Pré, Acadie and was probably living there with his wife. After the 1st siege and capture of the Fortress of Louisbourg on 16 June 1745 by British forces commanded by Sir William Pepperell during the War of the Austrian Succession, Jean Pierre, Marie Magdelaine and their children left were deported from Louisbourg to Belle Isle France by the British with most of the other Louisbourg French-Acadian inhabitants or escaped to Acadie or one of the Quebec, Nouvelle France communities along the St. Lawrence River. Since it is recorded that there were 11 surviving children in 1744 at Louisbourg prior to their deportation or escape from the Fortress in 1745, it is not known for certain which children accompanied Jean Pierre and Marie Magdelaine from Louisbourg since only 7 are recorded in the Louisbourg 1749-1750 Census along with 3 new additions to the family, Joseph, Jacob and Anne Bernard. During this period between 1745 and 1748, it is unclear where 3 of Jean Pierre and Marie Magdelaine's children may have spent these years. It is highly likely that Michel, having just been married in 1744, was living in Grand -Pré, Acadie with his new wife, Genevieve Hebert. However, the whereabouts of Marie Josephe, Jacques Andre and during this period are unknown. The Fortress of Louisbourg Archives Family Reconstitution File based on the Louisbourg 1749-1750 Census indicates that these 3 children were not living with Jean Pierre and Marie Magdelaine after they were repatriated to Louisbourg in 1748 from their exile. No records of the David family's life between 1745 and 1748 has been yet uncovered after the 1st siege of the Fortress at Louisbourg by the British in 1745. The records of their lives pick up once again with the Louisbourg 1749-1750 Census and the marriage of Marie Josephe to Jean Paul Pouilly on 1 June 1751 at Louisbourg. On 21 December 1745, Jean and Marie's 5th son, Francois, died at the young age of 19 years and was buried the next day at the church parish of Saint Louis, Rochefort, France. Their exile from Louisbourg did not deter Jean Pierre and Marie Magdelaine from continuing to grow their family. For when the family returned to the Fortress in 1749, as mentioned above, they did so with 2 new boys, Joseph and Jacob. 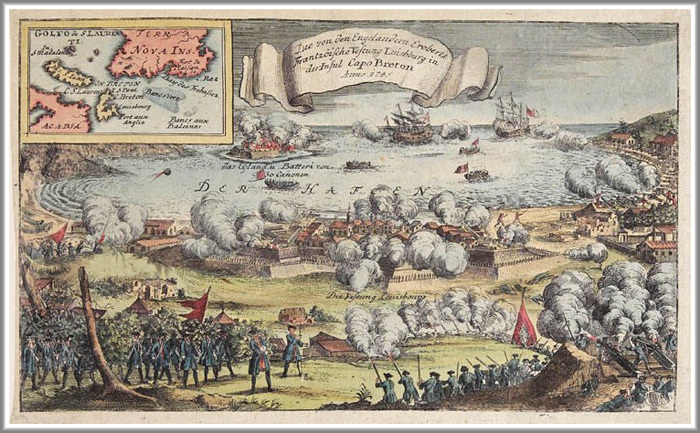 In 1748, the Treaty of Aix-la-Chapelle, which ended the War of the Austrian Succession, restored Louisbourg to France in return for the British trading post at Madras in India. The New England forces left Louisbourg, taking with them the famous Louisbourg Cross which had hung in the Fortress chapel. This cross was only rediscovered in the Harvard University archives in the latter half of the 20th century and is now on long-term loan to the Louisbourg historic site. After Jean Pierre and Marie Magdelaine returned to Louisbourg in 1749, they did so with 9 children and an orphan. These included 2 new sons, Joseph and Jacobs, who apparently were born during the 4 years of their exile, and an orphan by the name of Anne Bernard. According to the Louisbourg Census of 1749-1750, it appears that the other (7) children returning to Louisbourg from exile were Jean Jacques, Jean Baptiste, Louis, Claude Thomas, Francoise Charlotte, Jeanne Olive and Marie Magdeleine. The whereabouts of Francois between 1744 and 1753 is unknown. However, Francois surfaces again for the last time at the marriage of Louis Bino and Isabelle Le Meteyer on 11 September 1753. 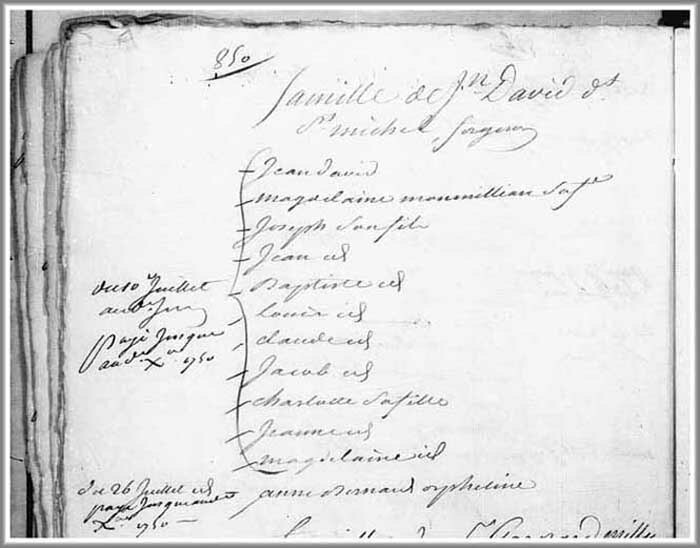 Francois' documented presence in Louisbourg is recorded in a Family Reconstitution File of his father, Jean Pierre David, which is archived at the Fortress of Louisbourg National Historic Site of Canada. This Family Reconstitution File was abstracted and compiled from original source documents archived at the Archives of Canadian and the Archives Nationale. To date, only one original source document has been uncovered that documents Francois as a witness at marriage of Louis Bino and Isabelle Le Meteyer on 11 September 1753 at Louisbourg. Based on Francois' signature on this marriage records, it indicates that Francois was possibly literate and could at least sign his name. On 11 September 1753, Louis Bino, son of the late Pierre Bino and the late Jeanne Milorit, his father and mother, natives of the parish of Saint Loup, Diocese of Poitou of La Rochelle on the one hand and Isabelle Le Meteyer, daughter of the late Jean Le Meteyer and of Jeanne Rousseau, her father and mother, native of Souneville, Diocese of Xainte on the other were married in Louisbourg. On 9 September 1753 a ban was published and two others were waived. Fre Isidore Caulet, cure of Chapel Royal of St. Louisbourg, presided at this marriage. Witnesses attending the marriage were recorded as Francois David, Francois Metayer and Couduay Dufes. 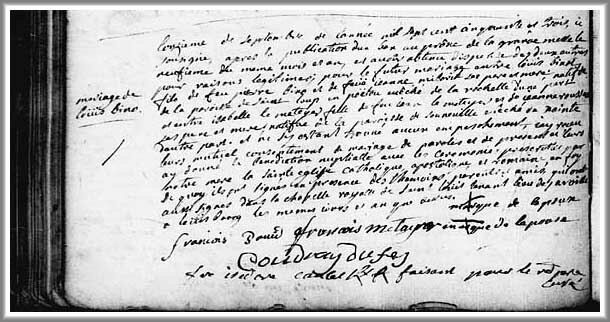 The marriage record above is of significance importance, for it is the only recording uncovered to date of the signature of Francois David at the end of the marriage record, confirmng that Francois was literate.